I think people are surprised when they learn that Southwest has a mascot—T. J. LUV. T.J. sightings are rare as he only makes appearances at very special events, such as when we landed into a little place called Atlanta (pictured above). 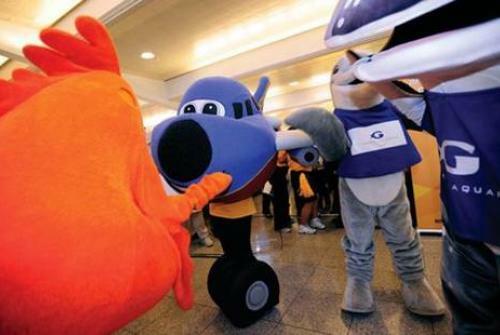 Curious about the history of this airline mascot, I did some digging and discovered this article that a previous intern, Lauren Webb, wrote last summer. I found it very interesting and thought you all would enjoy it too. Growing up, Southwest Airlines seemed to have always existed. And having been an infrequent flyer (I believe I took a total of three trips between the ages of one and 17), I never truly got the sense that Southwest’s origins were different from any other airline’s. These first few weeks at Southwest have completely dispelled those beliefs. … for my first blog post ever, I would like to introduce one of the most adorable characters in Southwest’s history—T.J. LUV. The inspiration for T.J. LUV came from the plump little jet in a children’s story Gumwrappers and Goggles (the tale of a jet) by Winifred Barnum Newman. Her story about T.J. (though Southwest and other airlines are never mentioned by name) might sound familiar to you. A pilot and a lawyer wish to purchase an unwanted airplane to start an airline, but first need permission from “the Grand-Chancellor of Air-affairs and Bailiwicks.” At first the plane was afraid the men would never get permission and return, but a fairy told him to have “integrity” to get through the struggle to fly and to show them his spirit. “After a time he was moved to a smaller airport. …He did his best to give good customer service to everyone.” But the two bigger planes from his hangar (interestingly colored Braniff blue and Continental silver) went to the “Most High Court of the Air Kingdom” and claimed that he was stealing their business. Fortunately, the lawyer represented the airplane in court, even though “he had not had time to change out of his rumpled suit.” The deciding factor in the case was T.J. LUV’s moving speech: “I want to continue to carry business people to and from the big cities. I want to give them good service, make their flights smooth, and love, your Honor, I want to give love!” While he spoke, he turned gold with a red belly and red and orange tail stripe (our original colors). Although missing our trademark ’70s hostesses and proclamations of love, the story sure sounds like Southwest. Our Founders were Rollin King, a pilot and business owner, and Herb Kelleher, then a lawyer, who would fight for several years to earn the right to fly (once even with Herb wearing a rumpled suit to court following an all-night preparation session for that day’s legal battles). And without a doubt, it was the integrity and stick-to-itiveness of our original Employees who made it possible for the story to even be written. I heard about T.J. LUV pretty early into my Internship. What made me take a closer look was discovering the program for Show Your Spirit, the musical based on Newman’s book. It ran in 30 cities between August 1983 and March 1984 with a cast of 16 singers, dancers, and actors. The musical had ten musical numbers, including “It Won’t Be Him,” in which the “Silver and Blue Crews are certain that the little dull grey plane will never be chosen to fly,” and “Colors,” in which T.J. is told “When you think of things, think of colors … Magic—Yellow, Love—Ruby Red…” But most exciting to me, the musical reflects its 1980s’ origins impeccably with reflective costumes. Newman’s story and its musical adaptation capture the SOUTHWEST SPIRIT and early struggles perfectly. It’s a story of inner magic, integrity, stick-to-itiveness, and the love that leads us all to earn our Southwest colors, just like T.J. LUV. This entry was posted in Southwest Airlines and tagged Southwest Airlines, T.J. LUV on July 16, 2013 by Bruce Drum.